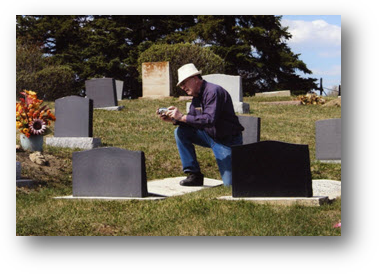 The Grande Prairie & District Branch partners in transcribing cemetery stones with the Alberta Genealogical Society. When we became conscious that our members were searching for photos of grave markers for their own families’ in international places, we realized we could offer a similar service to those looking in our area. The image collection for "Gravemarkers of Northwestern Alberta” is constantly growing thanks to many of our ardent branch members. To date, we have 21 cemeteries transcribed in our region and continue working on additional cemeteries each year. Note: The cemetery images in this collection are protected by copyright and are the intellectual property of the Grande Prairie & District Branch, Alberta Genealogical Society. Reproduction of these images for commercial use is prohibited without the written approval of the Alberta Genealogical Society. Personal use of images are permitted with a citation of the website. A citation model is available below showing examples of a bibliographic entry and footnote (or chapter note). This is provided for those researchers wishing to cite entries from the "Gravemarkers of the Northwest" database. “Gravemarkers of the Northwest.” Database. Grande Prairie & District Branch, Alberta Genealogical Society. http://www.abgenealogy.ca : 2015. “Gravemarkers of the Northwest Cemetery Index,” database, Grande Prairie & District Branch, Alberta Genealogical Society, (http://www.abgenealogy.ca : accessed 31 May 2015), database entry for John Charles Spoke (1886‒1936), Perryvale Cemetery. The Grande Prairie & District Branch would like to acknowledge the tremendous contribution made by Al Richards. Al passed away in 2012, although he left a legacy by editing, renaming and organizing the cemetery photos in an older version of this collection.